MountainOne Bank’s Debit Card with Chip Card technology protects your card in a whole new way. Chip Cards offer the latest in debit security and are very easy to use. A Chip Card includes an extra layer of security when you pay, because an embedded microchip encrypts your data when used at a chip-enabled register. A Chip Card can be used anywhere your other cards are used, but the Chip functionality only works at a business that has an activated Chip-enabled terminal. When your current MountainOne Bank Debit Card expires or needs to be reissued, you’ll receive a new Debit Card with Chip technology. If your old card has expired and is being replaced, your new Chip Card will have the same card number and PIN as your old card. If your old card needs to be reissued, for security reasons, before it expires, your new Chip Card will have a new card number, and you will be able to select your PIN. If you have scheduled recurring or annual payments using your old MountainOne Bank Debit Card, you will need to provide your new card number and/or card expiration date to the merchant(s) to avoid disruption of service. Give us a call at 855.444.6861, email us, or check out our FAQs below. A: A chip card is a standard-size plastic debit card that contains an embedded microchip, as well as the traditional magnetic stripe. 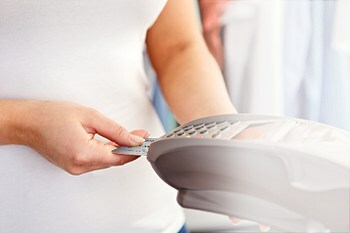 The chip protects in-store payments because it generates a unique, one-time code that is needed for each transaction to be approved. It is virtually impossible for fraudsters to replicate this feature in counterfeit cards, providing you greater security and peace of mind when making transactions at a chip-enabled terminal. Q: Why is a Chip Card more secure? The chip generates a unique one-time code each time you insert your card at a chip-enabled terminal. Your purchase can only be approved with the chip-generated code. Q: Is a chip card different than a smart card or EMV card? A: No, you may hear chip cards referred to as "smart cards" or "EMV™ cards" – they are all different ways of referring to the same type of card. Similarly, an EMV terminal is the same as a chip-enabled terminal. Q: When can I expect to receive a new debit card with chip technology? A: You’ll receive one when your old card expires or needs to be reissued. Until then, use your standard card with the magnetic stripe. Q: Why does my MountainOne Bank debit card now include a chip? A: As chip technology becomes the security standard in the U.S., many merchants are beginning to accept chip cards and we want you to be ready. You'll have greater security when making purchases at a chip-enabled terminal since the chip provides better protection against counterfeit fraud. Chip technology is already used in over 130 countries around the world, including Canada, Mexico and the United Kingdom, so you'll also enjoy greater acceptance when traveling internationally. A: It's easy. If the retailer has a chip-enabled terminal, simply insert the chip end of your card face up into the terminal. The chip card will remain in the terminal while the transaction is processed. To authorize your transaction, just follow the prompts as you do today. If the retailer is not equipped to read the chip card, just swipe as you do today. However, if you swipe your chip card at a chip-enabled terminal, the terminal may prompt you to insert your chip card into the terminal. Transactions made over the phone or online will not change. Q: Are chip cards safer to use than magnetic stripe cards? A: All of our cards are safe, and offer protection from unauthorized use of your card or account information. Chip technology offers another layer of security when used at a chip-reading terminal, because it generates a unique, one-time code that is needed for each transaction to be approved. Q: Can I use my chip card for all the same things as my old card? A: Yes, you can still make purchases as you always have — by entering the card number online or swiping your card at merchant locations that do not yet have chip readers. You can also continue to use your card at ATMs. A: Many merchants, across the U.S. are beginning to accept chip card transactions and this will continue to grow within the coming years. Chip technology is already used in over 130 countries around the world, including Canada, Mexico and the United Kingdom, so you'll enjoy greater acceptance when traveling internationally. Your chip card will still work at terminals where only magnetic stripe transactions are accepted. Q: Are chip cards secure? A: Yes. Chip technology has been around for over two decades and is already the security standard in many countries around the world. When purchases are made using the chip feature, the transaction is more secure because of a unique process that is used to determine if the card is authentic. This makes the card more difficult to counterfeit or copy. While magnetic stripe cards are still considered secure, chip technology is the next step to providing enhanced security to our customers. Whether you use the magnetic stripe or the chip to make your purchase, you can have confidence in the protection and security features we provide for all credit and debit card accounts. However, if you notice any suspicious activity on your account, notify us immediately by calling the number on the back of your card. Q: Will chip cards allow others to track my location? A: No. Chip card technology is not a locator system. The chip on your card is limited to supporting authentication of card data when you make a purchase. Q: Do the same benefits come with my chip card that I had with my prior card? A: Yes. You'll continue to enjoy the same benefits with your chip card as you do today with your debit. Q: Now that I have a chip card, do I need to notify the bank before I travel internationally? A: We recommend that you notify us of your travel plans, so your card access isn't interrupted. For your protection, we'll continue to monitor card activity even when a travel notice is set. If you encounter any issues while traveling, we're here to help. Q: Are there any situations where I could experience issues using my chip card? A: When traveling outside the U.S., some card readers at unattended terminals (such as public transportation kiosks, gas pumps) will require a PIN. However, this type of PIN technology is different than what you normally use for PIN transactions in the U.S and the card won't be accepted. In these situations, please locate an attended terminal to complete your transaction or plan for an alternative payment method, such as local currency. Q: Will my chip card still work at an ATM? A: Yes. You can continue to use your card as you do today by following the instructions at an ATM.